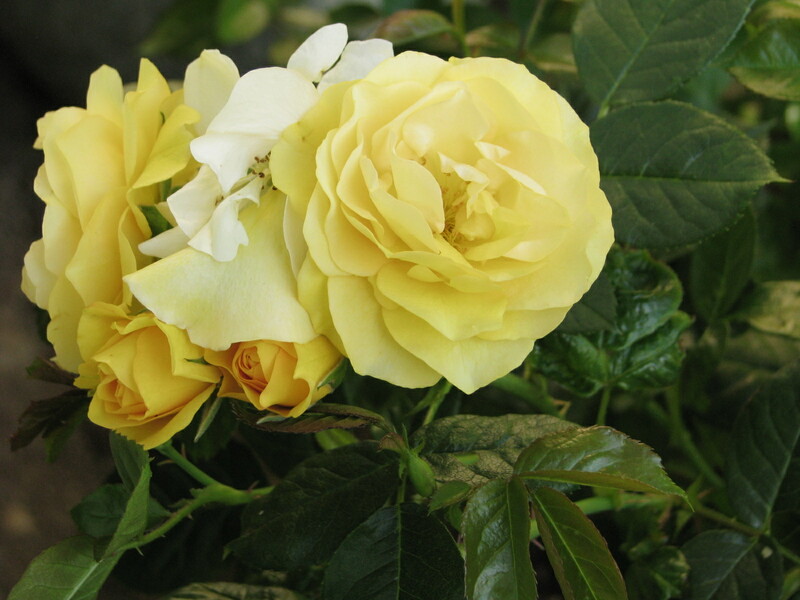 1.The smooth and creamy buttery yellow color, that changes with time and seasons. Sometimes rich and full, other times translucent and light. Yellow is not my favorite color, it’s closer to the bottom of the list, but this yellow just makes me stare. There must be something in my genetic code that attracts me to this rose. Maybe it’s not the rose, maybe it all comes back to butter. 2. The compact size of this floribunda. It doesn’t get big and gangly, but grows to about three feet. A tidy shrub of perfect proportion. 3. The innumerable blossoms. It started flowering early and just kept on going. In mid-summer I counted 48 buds on Julia Child, which seemed a lot for this compact plant. In December there were two modest flowers, struggling to fully open, yet stubbornly present. 5. Disease resistance. My rose stayed in a container, moved around too much and never had full sun. It did suffer from aphids and black spot, but after a few treatments with neem oil, it rebounded beautifully and sported dark, glossy green leaves most of the year. Truly one of the best. Which rose is your favorite? A lovely flower, it seems. And yes, it’s shade of yellow is almost identical to butter! Hmm.. my favourite rose. First of all, I don’t like black rose. I do love big red roses. But no, I don’t have a favourite – I love them all! I know they aren’t roses, but camellias are one of my favourite rose-looking types.